My husband keeps complaining about our master bath and how much he thinks we should redo it. Our house is not super old (only 12 years), but I can see his point. Here are some pictures I took a few weeks ago so you can get a better picture of what we are talking about. It was really hard getting some good shots as the bathroom is pretty small, but hopefully you will get the gist. Shot taken from door of our master bedroom. Here's what I do like about our bathroom. I love the neutral colors as I have a lot of color throughout my house. I love the antique chandelier I had my husband put in. That's about it. Not crazy about the carpet or the tile. The shower insert is the worst to keep clean. The tub, while nice and big, never gets used. It just collects dirt and hair. Ugh! Do you like all the mirrors that I have collected and never hung up. Well, since we've been talking about re-doing the bathroom for quite a while, I never saw the point if I would just have to take them all down again. So, here's what we want to do. We want to take out the carpet and replace with some kind of tile. We want to completely re-do the shower, make it bigger which will mean taking out the tub. 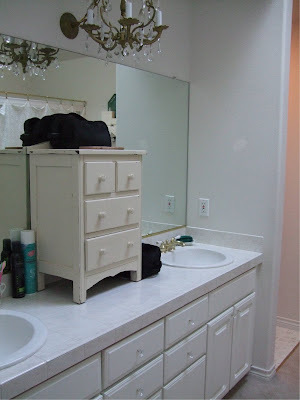 We will most likely keep the vanity, but replace the tile with something else, not sure what yet. Get new sinks and fixtures. Take down the giant mirror and replace with two smaller mirrors framed some how. Not sure what to do with the remaining space left by the tub. Maybe just leave a space for a cool old cabinet to hold bath supplies. I wanted to put in a built in vanity, but then we would have to monkey with electrical stuff and I'm not sure we want to go the the trouble for just one outlet. My dilemma is this. While I love decorating, the design stuff, not so much. I guess I just lack the confidence to do it. I have checked out 20 plus books from the library on bath design and everything I've seen is either too fancy or too modern for my taste. I really just want to keep it simple, but elegant and most important, easy to keep clean. I don't want a WOW! bathroom, but an Ahhhh... bathroom. Does this make sense? 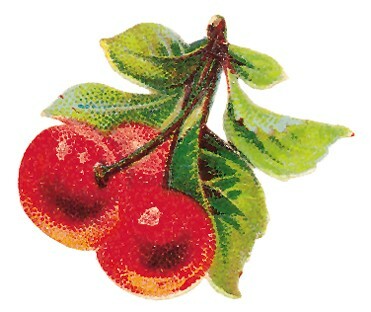 Some elements I would like to include if I can would be bead board (love it! ), maybe some glass brick around the shower, white or cream subway tiles, hex tiles (but I've heard they are hard to keep clean) and maybe some kind of solid surface material for the vanity top. We don't really have a budget for this project. We plan on doing most of the work ourselves with the help of our contractor friend. Ideally we would like to do it this winter. I am going to head over to Home Depot today to look at tile and other possibilities, but I would welcome any advice, suggestions from anyone who has gone through this. Please, I'm desperate! Okay, maybe not desperate, but I definitely could use some help. Actually, I think it looks lovely. I'd be a bit concerned about the mirrors around the tub though, chickee. If the glass broke it could injure you severely. Lovely effect though! I'd go for a bigger shower and getting rid of tub if you have another one in the house you could "soak" in should you so desire. But all in all, I'd say it's lovely. Calm and relaxing, honey pie. I have the medium sized hex tile from Home Depot on the floor and love it. If you seal the grout (and tiles) its pretty easy to keep clean. And with white tile and grout, bleach is always your friend. I'll be right over heheh. To quote a friend of mine, "I love choosing!" I would love to have soapstone in my house somewhere...and I really, really love the tumbled marble on our backsplash in the kitchen. 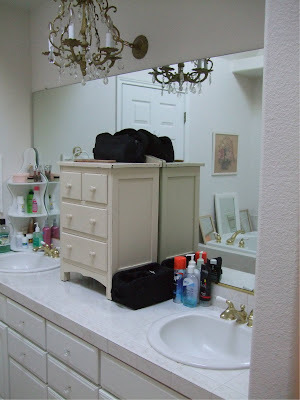 Nix the mirrors, get rid of the cabinet on top of the counter and ALL those extra rolls of toilet paper! Hide them! No one needs to see them. You are on the right track, tile, paint, and a little magic touch, it will look gorgeous! I have a great idea!! Spray paint the whole thing pink!! Nahhh just kidding. 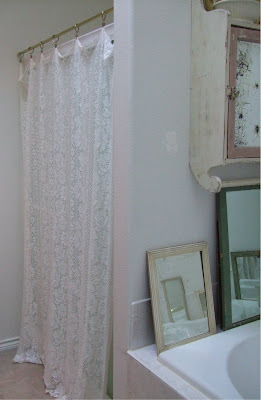 Maybe you should make a shower curtain, if you still need one when this is over, out of barkcloth.. Like soft creams and taupe maybe some brown.. it would be fun to have some vintage trim. 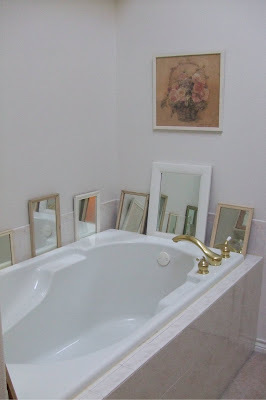 I like your idea of a cabinet where the tub was. Like a buffet, what about the floor? How about wood?? Something hair color for sure, but then what if that should change?? (Your hair not the floor)I guess that is enough great ideas from me. Call me about tomorrow when you have a chance. Hi there... I think you bathroom is pretty nice personally... A few little eye candy additions and I think you are good to go unless you have alot of money burning your pocket... 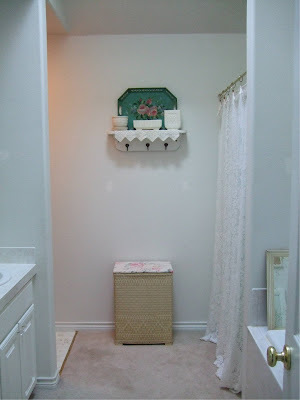 I think the little cabinet above your toilet area would be fine if you had a little skirt covering the area... could be placed up simply with velro even. 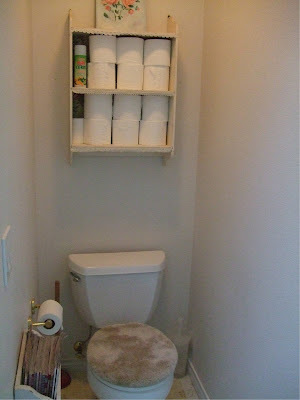 Just to enchance looking at the ever needed toilet paper.. I have been working on bathrooms lately. It can be so much fun and so challenging at the same time. I have two bathrooms that I have redone in the old house. But I do like mirrors too. I love tubs so I would update it or whatever but not get rid of it. I have bead board in my master bath and love it. What possibilities you have cuz you got the goods. I like Joy's assessment about the color I would do a on the darker side taupe with white subway tile. That would make it crisp without making it cold. 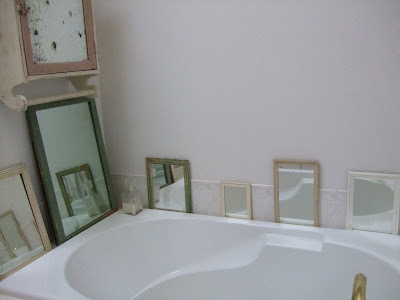 Then I would cut some bead board and frame it out on the vanity. You have some great mirrors. I would use those over the throne!That's the hardest part of design is the decisions. You have a great eye, trust your instincts.Happy Junken Trails.